I am tired. It’s been a long, good year full of trips and with little respite between projects. My legs are still willing, most of the time, but my mind needs a solid month of nothing in particular: no goals hanging over me. That will not come until December 2nd, the day the big game seasons close. As of today I have three unfilled tags and what remains of my resolution to keep hunting until they’re all filled or I run out of time. That level of commitment has given me some very rewarding and very frustrating times over the past two months. I’ve learned a whole different way to approach backpacking trips, and been obligated to reevaluate a whole raft of assumptions and techniques in the process. I’ve done more slow walking in the woods than any other time, ever. I’ve changed clothing, footwear, and camp gear to accommodate. I’ve gotten used to looking at just about everything in new ways. I’ve learned a lot about the animals I’ve been hunting, and how they interact with our mutual home. 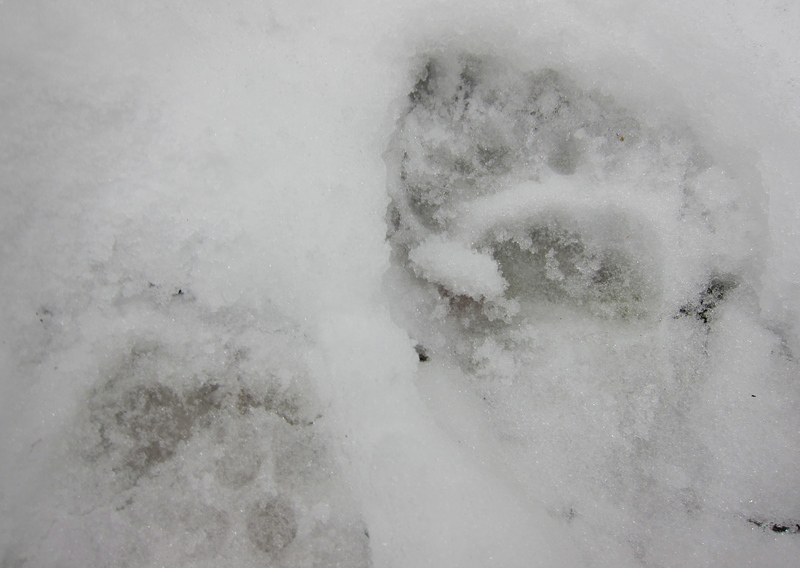 One morning last week I was up and out before dawn, stalking deer in the woods not far north of our house, when I cut fresh tracks from a small black bear (above). Very fresh, as soon after I started following it I could see the 100 meters or so it took at a run when I got close enough to spook it. Tracking after it settled back down into a walk might be the most intense moment of the whole season thus far. It had snowed intensely 36 hours before, and rained most of the previous day. The snow was deep, and tracking easy, under tree cover, but exposed areas had let most of the snow get melted away by the rain. On many occasions I lost my way and had to spiral out to pick the bear back up. It doubled back, ducked through the thickest stuff available, and generally behaved unlike any unmolested animal. It was trying, with a lot of focus, to shake me, and feeling that as I studied the faint impressions in leaves and snow covered logs was intensely intimate. I was pretty aggressive in my approach, trotting on the several occasions when it followed a snowy logging road, because I knew I’d run out of public land before anything else. And soon enough the bear turned south, ducked a fence, and left a set of track running between houses into patchy woods where I could not follow. That hour felt like 4. This weekend I made only one dismal attempt at hunting, but quickly returned home when I realized snow had driven critters out of that area, and that I lacked the focus which hunting deserves. I’ve got three weekends left, and intend to spend them all out there in the pursuit. I’ll see what can be found. Sounds like you’re very committed. I hope you fill all three of those tags, as I’ll be trying to fill my own. Goodluck! Sounds awesome, I’m curious what type of “camp gear” changes you’ve made. When hunting ends sundown and your back at camp by 6, what accommodations do you take to make camp more pleasant? This year was the first year I found myself carrying a Sven saw and thermarest camp chair, and interestingly enough I may carry that over into spring as well, as it’s becoming pretty nice. Also, good luck with the rest of the season. A good, light woodstove for drying stuff is pretty awesome, especially in the rain/snow which is typical for November. I’ve been playing with a Seek Outside Big Sibling recently and its pretty fantastic. Will write more in Jan/Feb when I have more nights in it. One more thing, and this for you also Jon. What kind of blades are you guys carrying with you out in the sticks? I’ve used a Havalon for all my game processing this fall, and it certainly gets the job done skinning. The waste of the disposable blades bug me, as does the many cracks and crannies you have to clean, but the function is inarguable. A small hatchet or tomahawk is heavy, but handy (even if it is just chopping the heads and limbs off birds and squirrels). I recently reshaped my Cold Steel Trail Hawk with a true convex edge using the sandpaper and foam mat technique, which added greatly to its abilities. Bowmachunter-Majority of my game is small game, so a nice mora knife does just fine for me. Cheap ($13), easy to find, and have no second thoughts throwing them out after a season if it doesn’t keep an edge. For what it’s worth I’ve been using one for two years with some brutal batoning (3.5″ dry ash wood) and still working just fine. I always have my sven saw durning hunting months for camp comfort, so if I needed additional application of force I’m covered. I’ve really enjoyed reading your posts on hunting. I’m a backpacker who has crossed over into the hunting world and I had a successful white tail hunt this past weekend. It’s great to be able to carry less and go farther until you’re faced with the reality of three miles, two feet of snow and a couple hundred pounds of very dead animal that needs to be dragged back. I would respectfully submit that a cheap tobaggan might be a wiser thing to include in your gear list. It would have made life so much easier for me.